Mother: Go clean up the dishes so I can prepare dinner. 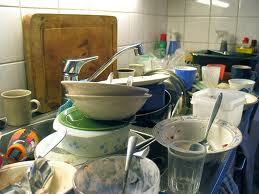 Teenager: But I already did the dishes once today! Mother: Your job’s to wash the dishes after I’ve cooked. Teenager: Yeah, right! Mother: And how many times a day do you eat? Teenager (Grumbles): But I’m not doin’ the dishes EVERY time we eat! Once a day’s enough! Mother: …Preparing only one meal a day! By the way, just so I’ll know, what’ll it be: breakfast, lunch or dinner? This entry was posted in Emanitawrites, Humor and tagged household chores, teenagers and dishes. Bookmark the permalink. I shortened it for submission to a Bluebell Short Story Slam prompt.